Ford is aggressively targeting the lowering of its waste-to-landfill numbers for each vehicle produced and plans to reduce that by 40 percent per vehicle by 2016 in a new five-year global plan. Ford has implemented a new five-year plan to reduce waste globally by targeting a 40 percent reduction in waste-to-landfill per vehicle. That equates to dropping landfill waste to just 13.4 pounds per vehicle. Ford was the first automotive company to have a zero-landfill production facility in North America when its Van Dyke Transmission Plant made that goal last year. The ultimate goal, says Ford, is to get as close to that as possible with all of its facilities. This new goal would build on the same goal made from 2007 to 2011, in which Ford reduced waste-to-landfill per vehicle by 40 percent to just 22.7 pounds (versus about 38). The new strategy comprises several waste reduction plans that will run concurrently, reducing waste at various levels in the corporate and manufacturing process. This includes working with global suppliers to improve their landfill numbers, continuing its program to make its worker's canteens and kitchen facilities zero waste, and improving both manufacturing and recycling efforts across the board. 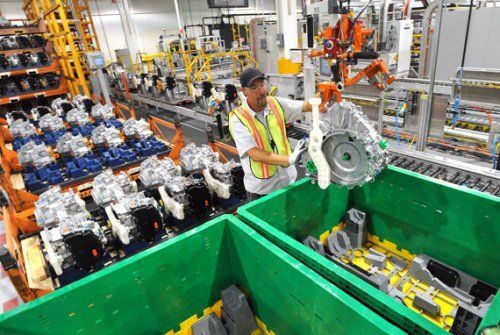 The benefits are tremendous, with both environmental accolades coming to the company as well as financial incentives with Ford generating $225 million in revenue just from recycling efforts last year in the U.S. and Canada alone.